Welcome to Take It Or Leave It, where each week we pick out some of that week’s newest comics and give you our opinion on whether it was worth the price and you should take it, or if it was better left sitting on the shelf. Well with Events ripping through the Big Two you might be having trouble picking out stuff worth reading. I know I keep giving Hickman and Infinity chances and just keep getting let down. And lets not even talk about Villains month, for as interesting as Forever Evils opening issues was, this Villain issues of our normal DC books are just boring. Luckily enough there are some pretty good new number 1’s out this week from various publishers. SAMCRO makes their comic debut and Zenescope starts marking off names with Hit List, oh and Marvel has a little titles called Mighty Avengers with a couple cool heroes like Spider-Man and Luke Cage. Enough about that though, lets get started with Take It Or Leave It. Every fall I look forward to the new season of Sons Of Anarchy, it’s such a crazy show you can’t help but want to see what mess SAMCRO gets into next. So it’s easy to assume I was excited when I heard about a new comic series spinning out from the show. 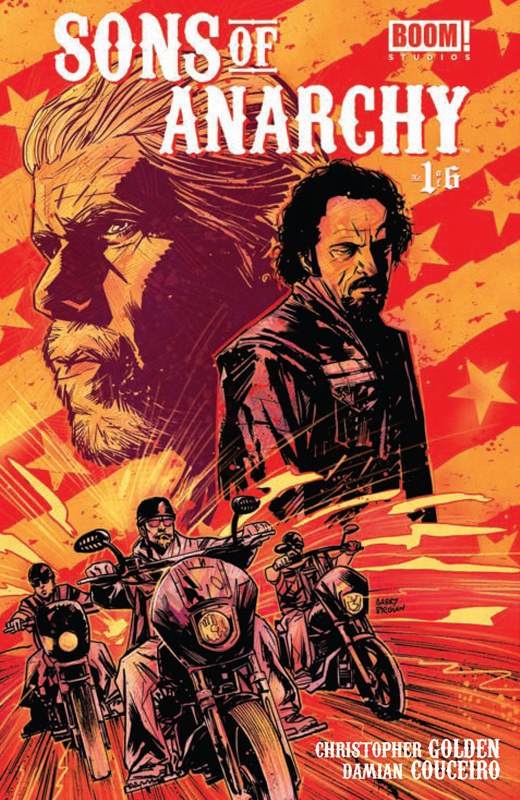 Obviously going into something like this you want to be a little reserved, luckily this first issue of Sons Of Anarchy delivers a lot of familiar stuff, but still keeps the story fresh. We see faces we’ve known for years, just displayed in a different way. And of course the expected amount of violence is on hand too. It looks like the series is taking place sometime between present day on the show and mid-season last year. Jax is the president, and Bobby is still his VP. And Tig has already lost his daughter and is fully into the downward spiral we saw in the season premiere this past week. I think the cool part about this book is going to be the change of perspective, we’re used to have Jax be out main point of interest, but with this first issue it’s definitely Tig. And that can certainly change as times goes on. 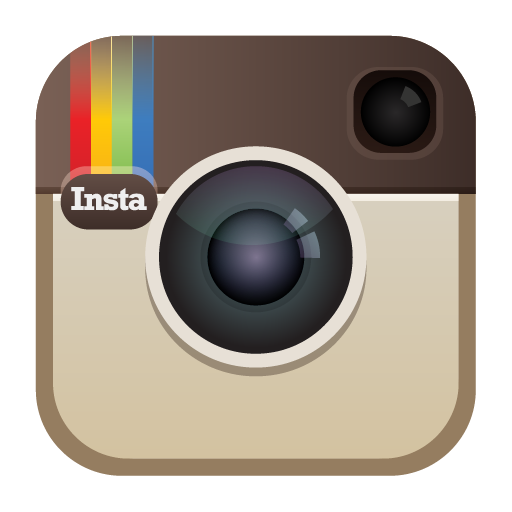 The only drawback I’m finding is the very washed out sorta mono-toned coloring. The art itself really fits the book, and the characters are easily identified, but something about the colors just doesn’t work. That’s a minor drawback to a comic that in it’s first issue, captures a lot of what makes the show so much fun to watch, lets hope they can keep it up. This was a pretty disappointing read, since the New 52 started Aquaman has been a great book to read, and with Geoff Johns at least co-writing a book about the Ocean King’s nemesis seems like it would be solid. Only it’s not, a good portion of the book is just different angles and different artwork from Forever Evil #1, we really don’t get anything good out of this other than a few panels here and there of what I can only assuming is foreshadowing. DC really did good last year with the 0 issues, this years Villains month seemed to have promise, but so far it’s just a waste of time and money. 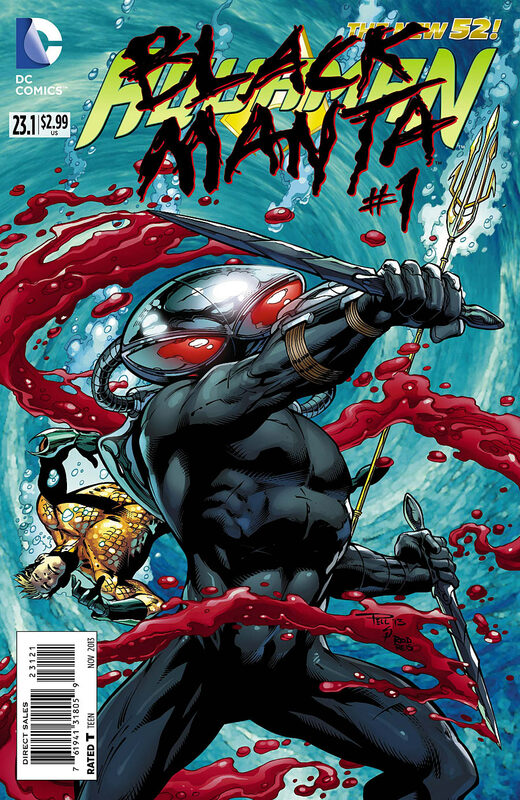 Also between this and Forever Evil #1 we know how things end up in Aquaman by the end of issue 25, so that’s cool. . . well not really. I just don’t understand how Avengers, and Infinity are getting so much praise. These books aren’t good, they’re over crowded with no forward momentum. 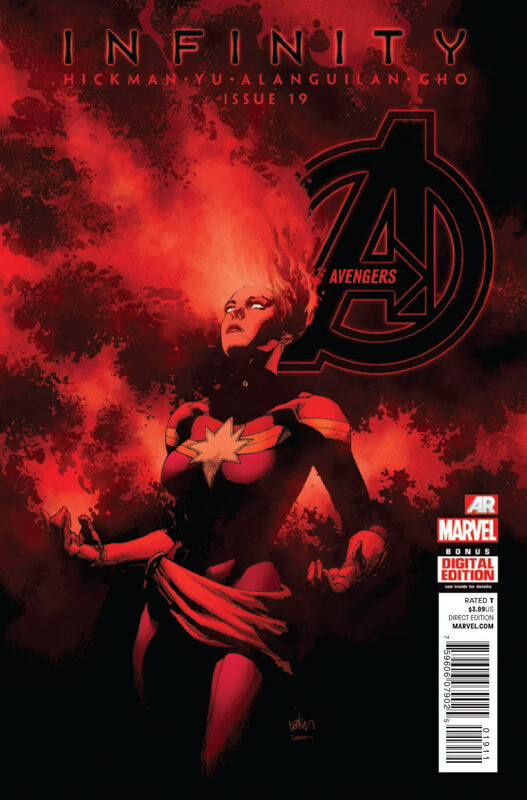 Hickman’s entire run so far on Avengers and New Avengers has all been the same, and now it’s spread into Infinity. All of these old (and failed) plots from the past aren’t helping it either. It’s a real shame too, I can see the promise in the stories concept, but the execution is just terrible. This whole thing needs to be scaled back and focused better and not so jumpy and all over the place. It’s so uninteresting at this point I don’t even want to talk about it. Just do yourself a favor and save your money, go read something else instead. 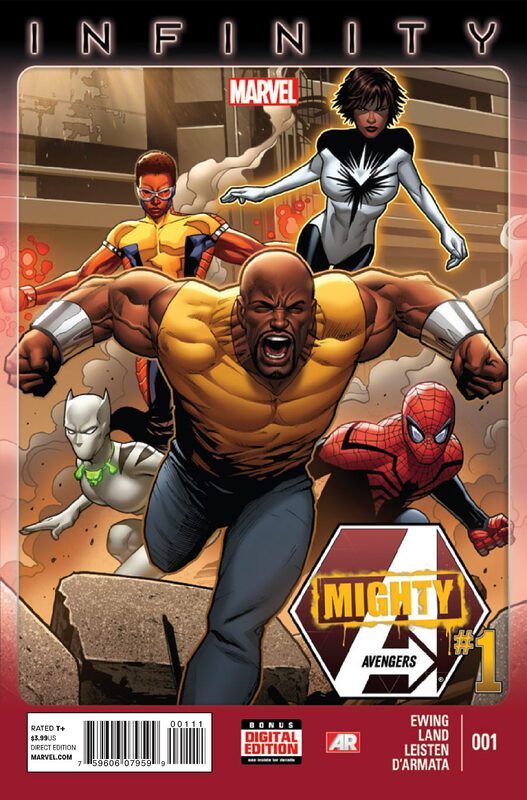 I wasn’t going to read Mighty Avengers, so far everything Infinity touches it kills, but I like Luke Cage and it was a shame to see him leave New Avengers at the end of Bendis’ run. Compared to the other Infinity tie-in’s and main books this is a welcome addition. 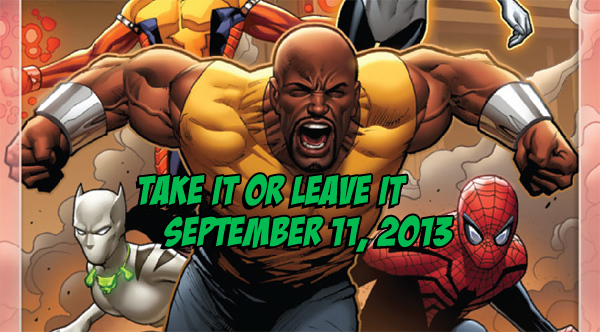 Mighty Avengers barely constitues being in the same event as the rest of the books, well for this issue anyway. The book is framed by the events happening in Infinity, but the real story is here is about Cages new team of Heroes For Hire with White Tiger and Power Man. With Spidey and Monica Rambeau get tossed in for good measure. We’ve also got a mystery hero who’s trying to keep themselves secret even to the other heroes, except Monica. Overall this issue was pretty good, and I can see some hope for the series after it fully breaks away from Infinity, but I think the coming issues may suffer from the plague that Hickman has unleashed on the Marvel books. I didn’t fully know what to expect when I started reading Hit List. 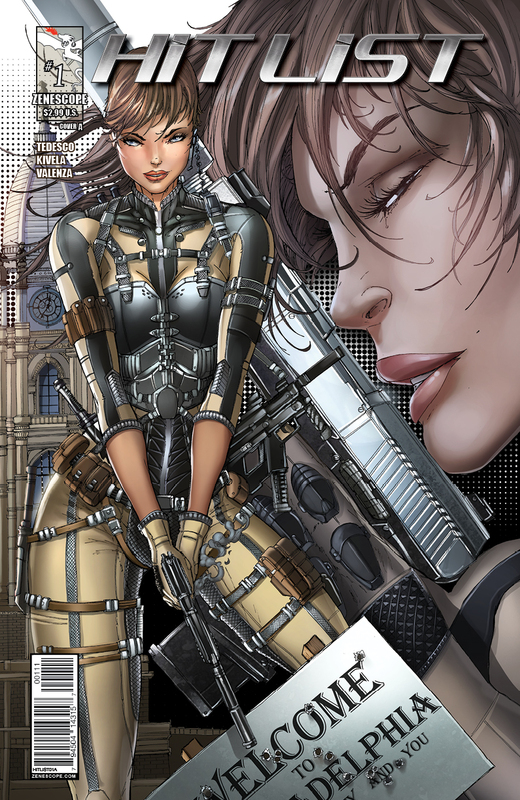 I figured it was about an assassin or two, I assumed the girls from the covers would be it. Boy was I wrong, while not a lot went down in this first issue, it definitely set up and intriguing premise and a lot of mystery as to what exactly is going on. While I never got to read the comic version of Wanted, this book reminds me a bit of the movie adaption, minus the weird supernatural stuff. There’s this secret organization going around killing people that are from first appearance pretty scummy. So what’s not to enjoy about that? If you only know Zenescope for their Horror and Fantasy themed books, this one should show you that the company has a lot more to offer comic fans.